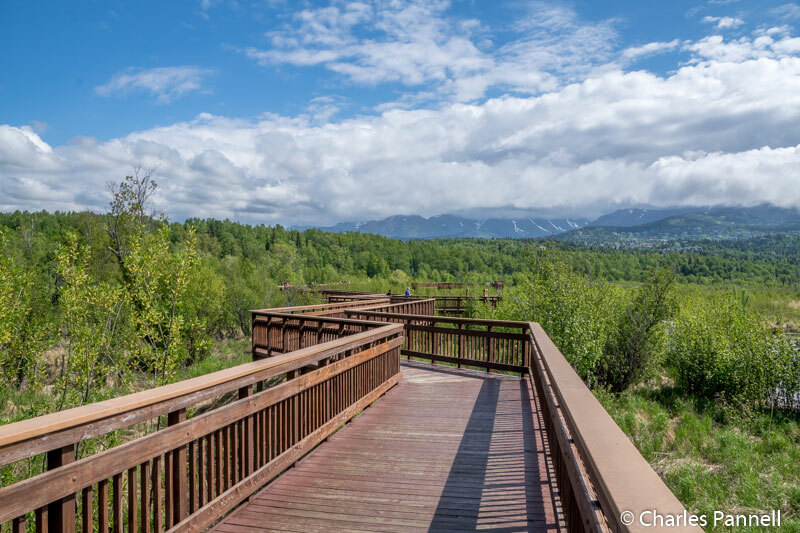 Although there’s no shortage of fun diversions in the bustling city of Anchorage, visitors often overlook sights located outside of the city center. Granted, it takes a little planning to take them all in, but it’s well worth the effort. So rent a vehicle, pack your sense of adventure, and get ready to explore these outlying accessible attractions on your next Anchorage visit. Surrounded by the Chugach Mountains, the Alaska Native Heritage Center (www.alaskanative.net) tops the must-see list. It’s just a short drive north of downtown Anchorage on the Glenn Highway; however this open-air museum seems a world away from the trappings of city life. 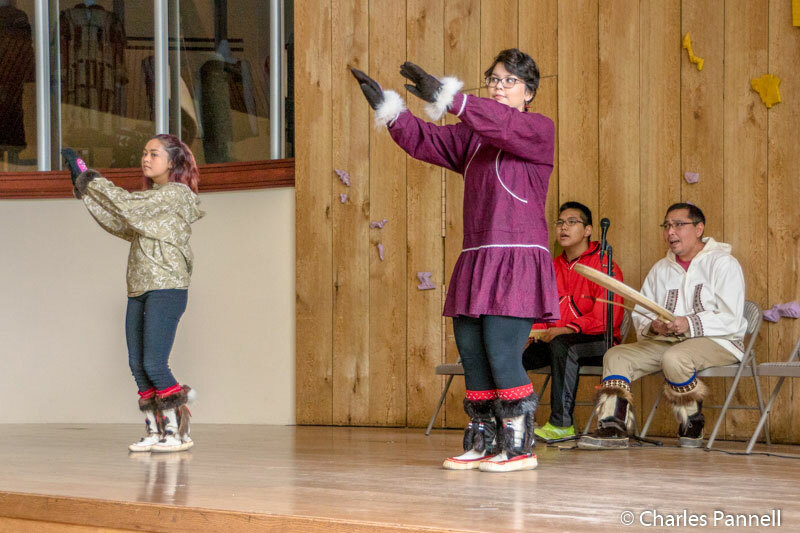 Situated on 26 acres of prime forest land, this top-notch cultural attraction offers exhibits and programs about Alaska’s indigenous people. Access is good at the Alaska Native Heritage Center, with plenty of accessible parking in front, a handy drop-off zone near the door, and level access to the front entrance. There’s a wheelchair available for loan at the front desk, and accessible restrooms near the entrance. A gradual ramp leads from the information desk down to the Gathering Place, where dances, games and stories are shared throughout the day. And because there are movable seats in front of the stage, wheelchair-users have their choice of seating options. There’s also level access over to the Hall of Culture, which offers interactive exhibits about the five cultural groups in Alaska — Athabascan, Yup’ik and Cup’ik, Inupiaq & St. Lawrence Island Yupik, Ugangax & Alutiiq, and Eyak, Tlingit, Haida & Tsimshian. Films are also screened throughout the day in the adjacent theater, which offers level access and wheelchair and companion seating. Outside, a level paved pathway circles the lake, where villages representing the indigenous people are located. Each village contains at least one structure, with clothing, weapons, tools and other artifacts of that culture on display. Members of the group — usually youth — are on hand to talk about their culture and to answer questions. And although some buildings have a few steps, it’s still possible to get a feel for each culture from the other interpretive exhibits. It’s a very well done interpretive presentation in a lovely setting. And if you’d like to linger a bit, there are also benches along the way. Don’t forget to take a stroll through the gift shop on your way out, as it’s filled with some equally enticing cultural treasures. 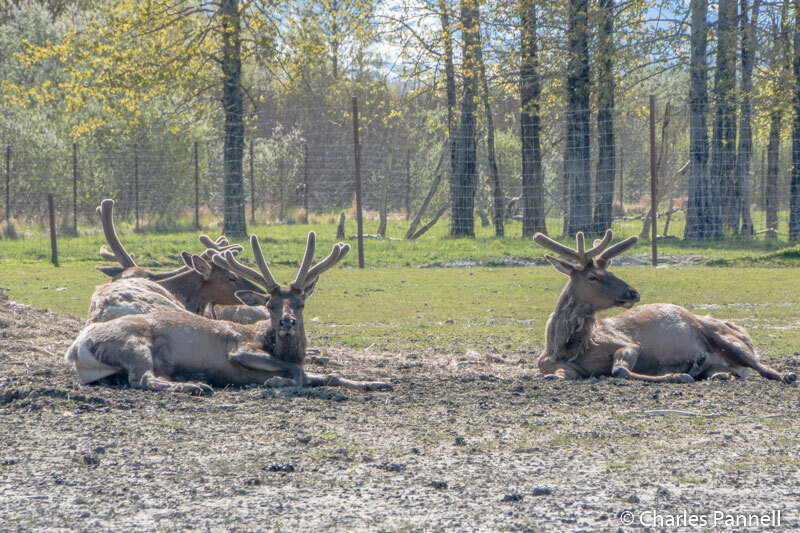 If you’d like to get an up-close-and-personal look at some native wildlife, then be sure and stop in at the Alaska Wildlife Conservation Center (www.alaskawildlife.org). Technically this attraction is located in Portage, about 48 miles south of Anchorage; however it’s definitely worth the one-hour drive. The compound is easy to find too, as it’s on the Seward Highway, just north of Portage Road. Although there’s no accessible parking, there is a large level lot near the cafe and gift shop. There’s ramp access up to the main building, which also has accessible restrooms. And don’t miss the lynx, owl and bald eagle exhibits in the enclosures behind the gift shop. To be clear, the Alaska Wildlife Conservation Center has a mission of education and conservation. It’s not a zoo, and quite a few of the animals are rescues. That said they house everything from porcupines, moose and elk, to bears, fox and even bison. The animals are kept in large enclosures, many of which have boardwalks or walkways around them. 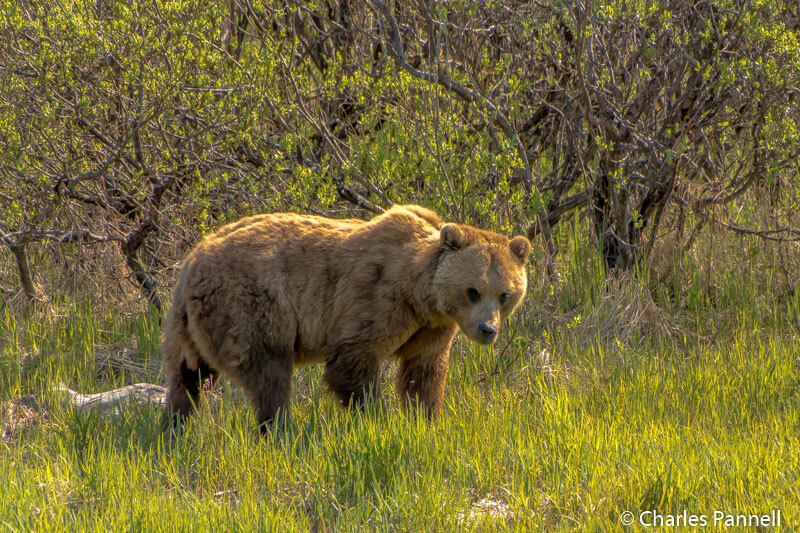 Visitors can choose to walk the two-mile level route around the enclosures, or drive their own car and park at the bear boardwalk or the Turnagain Arm boardwalk along the way. Although there are no accessible parking spaces at either stop, there are large level lots with room enough to parallel park. The bear enclosure is a must-see, as a boardwalk travels above the exhibit which houses both black and brown (grizzly) bears. And although the Turnagain Arm boardwalk is just outside of the park, it’s definitely worth as stop to see the bald eagles swoop down over the snow-covered mountains, and glide over the mud flats in search of some food. Additionally, there are benches at the end of the boardwalk if you’d like to sit a spell and take it all in. Last but not least, save some time for a little birdwatching at one of the most accessible bird viewing boardwalks in Alaska at Potter Marsh (www.adfg.alaska.gov/index.cfm?adfg=viewinglocations.pottermarsh.) Located about 10 miles south of town on Highway 1 near Milepost 117, this sanctuary is ironically located across the street from the Rabbit Creek Rifle Range. And although the sound of distant gunfire can be somewhat disconcerting, it hasn’t deterred the birds from visiting this site. Accessible parking is located near the boardwalk, with accessible vault toilets nearby. The level boardwalk extends a half-mile out over the wetlands and offers several viewing blinds and overlooks along its length. And it’s all very wheelchair-friendly with lowered viewing slots in the blinds, accessible scopes and lowered railings at overlooks for unobstructed wheelchair viewing. And if you’d just like to sit down and enjoy the view, there’s no shortage of benches along the way either. Potter Marsh is a year-round birdwatching venue, with geese, ducks and grebes in residence from April to September; and gulls, terns and shorebirds the rest of the year. Bald eagles are also frequently spotted in the cottonwoods near the base of the bluff, so bring your binoculars for a look at these magnificent birds. Rabbit Creek — which is located about halfway along the boardwalk — is a good spot to catch a glimpse at spawning chinook, coho or humpback salmon, from May to August. And although Potter Marsh is ground zero for avian life, you can also spot moose there in the early mornings in late spring and early summer. This secluded refuge also makes a good stop on the way to Seward. And since there’s no admission charge, it’s very easy on the wallet. 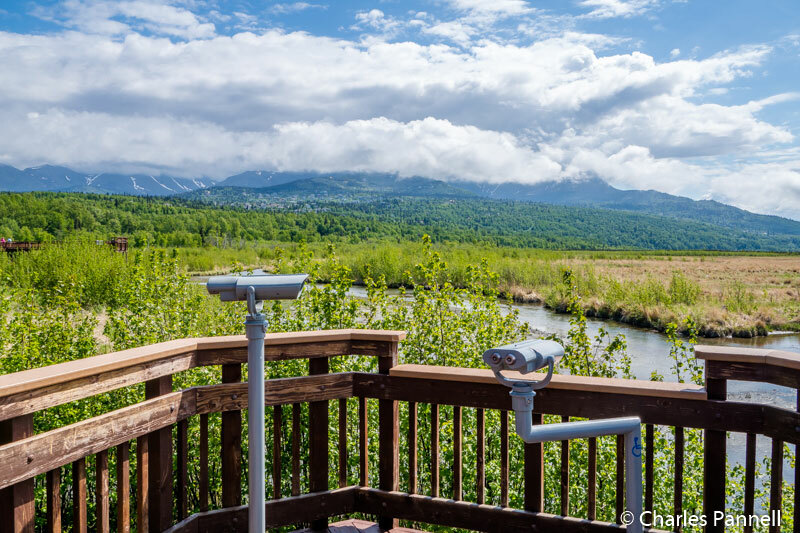 So whether it’s a day trip or a roadside stop, be sure and pencil in this birding hotspot on your next Alaska itinerary.